Aasbo immediately threw down the gauntlet at the Gateway Motorsports Park, qualifying first overall on Friday to earn a bye through to the Top 16, where he faced down Jhonnattan Castro. The Gateway Motorsports Park sits just outside St. Louis, Missouri, and is a new addition to the Formula Drift series. A flat, fast road course, it quickly became clear that power and speed would be critical in the hunt for victory. After advancing past Castro to the Great 8, Aasbo beat out Chris Forsberg to move into the Final 4. There, he met Piotr Wiecek, who proved a formidable rival. Fans were on their feet as Aasbo and Wiecek pushed the limits through six head-to-head matches. Judges were undecided through two one-more-time calls before they finally awarded the round to the Rockstar Energy Drink / Nexen Tire Toyota Corolla Hatchback in an unanimous decision. In the Final, Aasbo faced Matt Field. During Aasbo’s lead run, Field made an error and made contact with the back of Aasbo’s car before running wide off the track. Judges confirmed Field was at fault for the clash and all it took was for Aasbo to put in a clean chase to come away with the victory. The win was an important one for the team. Championship leader James Deane had been pulling away from the field, but a blown motor during the Great 8 opened the door for a renewed points battle as the season heads into its final two rounds. With both the best qualifying run and event victory, Aasbo took maximum points this weekend and is now within 30 points of the leader. The battle resumes in Dallas, Texas, September 14-15 and concludes a month later at Irwindale Speedway in Southern California. Formula Drift enjoys a dedicated and engaged audience with sell-out crowds all season long. Grandstands at the new St. Louis event were packed by early Saturday, with fans clamoring to get close to the action from the first moment cars hit the track. This season, each livestream broadcast is averaging more than two million viewers. 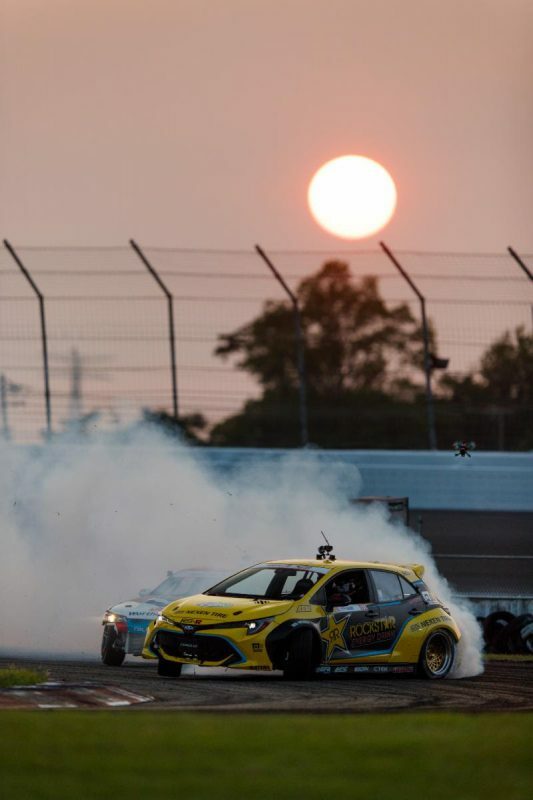 The Rockstar Energy Drink / Nexen Tire Toyota Corolla Hatchback takes victory at the new Formula Drift venue in St. Louis (PHOTO: Larry Chen/Toyota Racing).